Like Krishna in the Gita, Bannon believes that the world is in moral crisis. The West is declining politically and economically from a lack of mooring in traditional Judeo-Christian values. “We’re at the very beginning stages of a very brutal and bloody conflict… (and we) need to fight for our beliefs against this new barbarity that’s starting, that will completely eradicate everything that we’ve been bequeathed over the last 2,000-2,500 years,’’ he told an audience at the Vatican in 2014. In his apocalyptic view, the world is a cosmic battlefield in a clash of civilisations. He is reportedly behind the United States’ recent attempt to bar nationals of Muslim countries from entering America — a first step, in his mind, towards an eventual victory against Islam. Deeply religious Hindus will be outraged at the idea that one of their holiest texts is being misused for militaristic purposes. The intriguing question, however, is how can the moral idea of ‘dharma’ attract both the militarist, Steve Bannon, and the pacifist, Mahatma Gandhi? One answer to this question is that the Gita has something for both. To the warrior, it proclaims, do your dharmic duty and fight a just war. To the philosopher and the devotee, it offers the paths of wisdom and love (via jnana and bhakti yoga). A second answer is that the great texts lend themselves to multiple interpretations. To Gandhi, the war of the Mahabharata was an allegorical, ongoing battle between dharma and adharma inside every human being. The very first word of the Gita, ‘dharmakshetre’, signals that this is no ordinary battlefield; it is also a field of righteousness. A third possible answer lies in the opposing positions of Arjuna and Krishna. When Arjuna refuses to fight, he is giving the following message to all rulers: before declaring war, consider its moral consequences — is it worth dying for? Normally, our rulers only consider political and economic consequences. There would be far fewer wars if rulers thought that they, in fact, might be killed. A fourth answer lies in two different meanings of dharma in the Gita. Gandhi was attracted to sadharana dharma, which consists of the inner virtues of the conscience — ahimsa, ‘not hurting another’ or satya, ‘telling the truth’. Bannon is attracted to sva-dharma or social duty, which translates to: “I am a Kshatriya and my duty is to wage a just war.” Thus, the Gita can be read both as a pro-war text and an anti-war text. Finally, the difference between Gandhi’s and Bannon’s positions comes down to the problem of means versus ends. Krishna believes that the end of preserving the world justifies fighting a just war. In hesitating to fight, Arjuna obviously feels that there are limits to making war even if the end is worth pursuing. One can empathise with both — human beings are susceptible to both types of moral intuition. 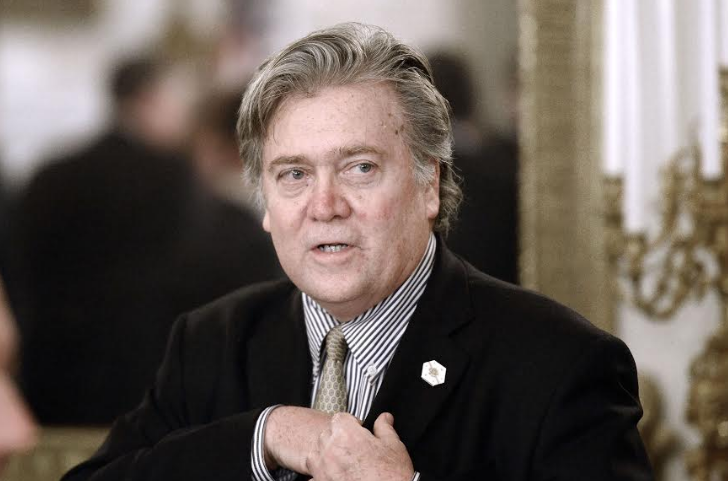 Many Indian nationalists — Tilak, Hedgewar, Lajpat Rai, and even Aurobindo — would have been on Bannon’s side when it came to fighting for India’s freedom. But of course, Mahatma Gandhi prevailed. Indians should worry that Bannon might unleash a disastrous war in the Middle East. “Steve is a strong militarist, he’s in love with war — it’s almost poetry to him,” says Jones. Bannon is not unintelligent — he was considered among the three most intelligent by his classmates at Harvard Business School — and this makes him more dangerous. It is worrisome that an American president, who has enormous war-making powers, has Bannon as his closest adviser. Before undertaking a war, Bannon would do well to go back to dharma and the Gita and re-examine the rich ambiguity of both. He might well come up with a different answer, perhaps inspired by Arjuna’s refusal to fight in the Gita or by Gandhi’s ethic of non-violence.